We have previously let you know about concerns arising around side street design in new schemes within Glasgow, and as detailed in our previous blogs, have been in touch with Sustrans and Glasgow City Council about the safety issues we feel are important to urgently address. Consultation Digest Issue 30, 19 March 2019: Get your views in now to the SPT regional survey and the Get Glasgow Moving petition, and is transformation possible? In this issue we have two chances to input on public transport. The first is closing tomorrow, for the SPT, which is very active and public transport oriented, and the second is a Get Glasgow Moving petition. A strong voice on the Get Glasgow Moving input could influence official thinking on both the SPT and transformational frameworks such as that for the Glasgow Broomielaw featured below. Plus a late entry – a survey on a possible bike hire scheme in Motherwell! However, 2 further late entries to this Digest throw a cloud on the long-promised Sauchiehall Street avenue concept. Consultation Digest Issue 29, 05 March 2019: The Good the Bad and the Ugly news from all around. A variety of news again, glimmers of hope with reducing motor traffic in Glasgow city centre, the regeneration of the Broomielaw, and the next phase of the Battlefield consultation, but concern about delays with Byres Road and the disappearance, hopefully temporarily, of the Renfrew to Shieldhall cycle lanes consultation. This, and lots more, below. We have been notified of works that will be taking place on the City Union Bridge at Adelphi Street, between the Central Mosque and the Nautical College. Network Rail will be doing some refurbishment works on the rail over bridge at Adelphi Street between 18/2/19 and 7/4/19. Consultation Digest Issue 27, 05 February 2019: University Avenue and Bears Way under threat, no cycle lanes for Union Street, Glasgow, but a wee bit of good news as well. We’ve got wind of potentially terrible news for University Avenue, and in other bad news, the Bears Way cycle route through Bearsden is under ongoing attack, with the latest move by East Dunbartonshire Council to extend car parking at Milngavie Station, rather than extend the Bears Way. It needs its friends back. 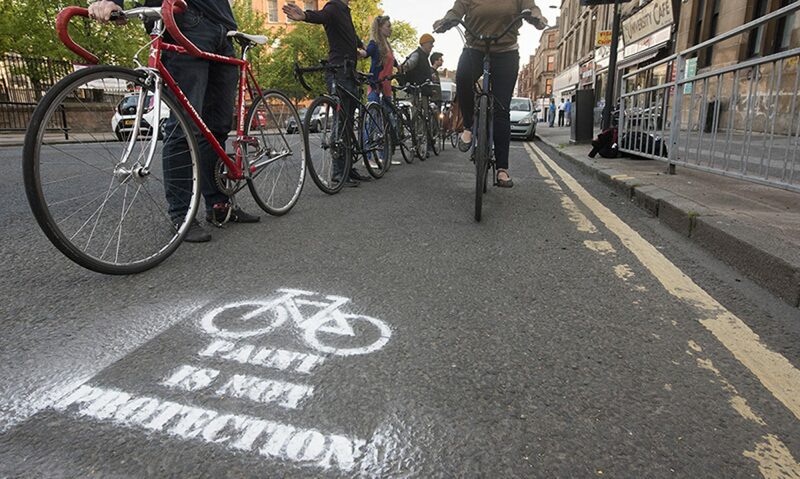 In other news Glasgow City Council have rejected yet another plea for northbound cycling on Union Street, but read on for more news, some of it good.